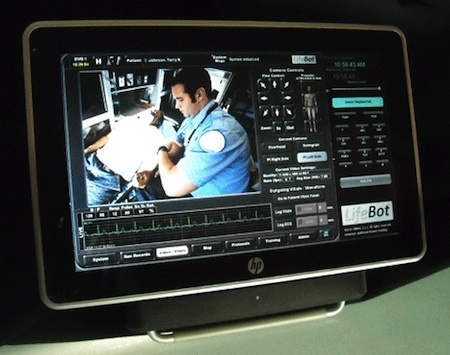 The LifeBot medical tablet computer provides an all-in-one device for ambulance personnel bringing a patient into the emergency room. The device runs Windows 7; it can transmit live patient data to the receiving hospital via the DREAMS software developed with U.S. Army Materiel Command, Texas A&M, and UTHealth Science Center at Houston. Utilizes a Hewlett-Packard Slate at just 1.5 pounds weight and 9.21 x 0.58 x 5.91 inches size integrating a 1.6GHz Pentium PC 2MB RAM and 64GB flash drive with video resolution of 8.9" diagonal WSVGA wide-viewing angle touchscreen. Integrated 3 MP camera (outward facing); Integrated VGA webcam (inward facing) provides display of both patient and operator in field use. Also enables sending of individual high resolution still images. Utilizes exclusive DREAMStm telemedicine system developed with U.S. Army Materiel Command and others, the most advanced in the world specifically designed for emergency and disaster systems deployments. DREAMStm features include sending and receiving of live patient physiological data, live play-by-play screen color drawing and annotation, isolated video zoom to hi-res imaging, complete patient triage and medical record ePCR charting system, multiple cameras remote controls with management of resolution, panning, zooming, etc. It also may store all trended patient charting and physiological data in its on-board SQL database server. Instant Messaging and Paging: Send instant messaging e-mail alerts and mass file or data distribution to hospitals or providers directly from private secure portal display. Also may be used for TeleStroke, TelePsychiatry, Teletrauma, Dermatology, Translation Services, Primary Care and Correctional Health Systems, Teletriage, and any General Telemedicine application. When utilized with the LifeBot® Communications Controller the LifeBot® Slate may also be used to wirelessly perform UHF, VHF, 800MHz, 700MHz, P25 radio and telephone communications. Tested and approved for use with Odyssey Patient Teletriage software that may enhance triage efficiencies and substantially reduce errors and risks. AES encryption for HIPPA compliancy. 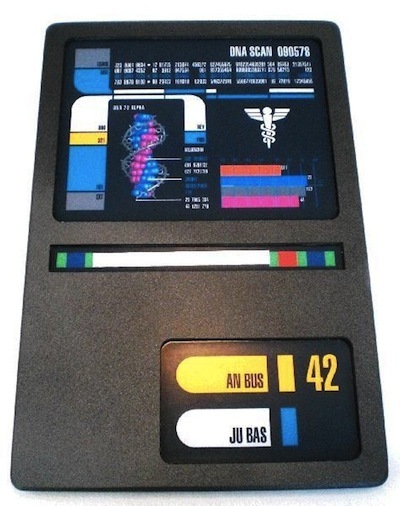 Science fiction fans are long familiar with medical tablet computers, thanks to shows like Deep Space Nine.